Originated in Utrecht as a collaboration between the festival and long-term partners Basilica Hudson, 24-Hour Drone is a roving, international series featuring musicians and sound artists experimenting within the spectrum of drone. After editions in Utrecht, The Netherlands; Malmö, Sweden; Montreal, Canada; and Salford, UK, the project will return to Hudson, NY, on 28 & 29 April. 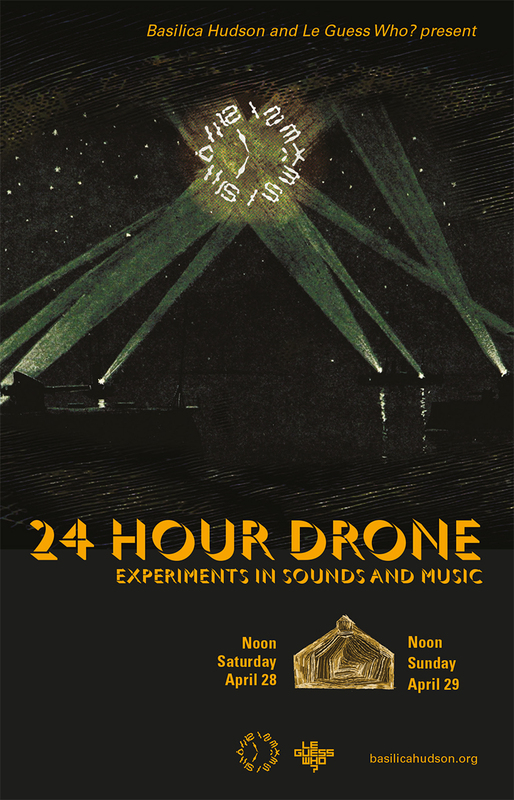 The initial line-up for 24-Hour Drone features many exclusive collaborations. The first confirmed artists are: noise musician Pharmakon; forefather of ambient electronic music and Brian Eno collaborator Laraaji together with Arji OceAnanda; New Castrati; Buke & Gase’s Arone Dyer in collaboration with Dronechoir Syllaba; Sontag Shogun together with scentscape artist Alex Beth Schapiro; Bill Brovold and the Mystical Miniature Orchvestra; harpist Marilu Donovan & bassist Tristan Kasten-Krause; New London Drone Orchestra; Capital Region Celtic Pipe Band; the contemporary Javanese music of Gamelan Kusuma Laras; Hotel Neon; and the Persian traditional crossover sounds of Iranian musician Sabha Sizdahkhani. Queens-based artist Drew Joy will spend a week in residence at Basilica Hudson to create a site-specific piece highlighting the unique textures and reflectivity of the space.